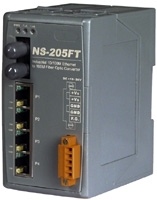 The ANS-205F/ANSM-205F series is a Unmanaged 4-Port Industrial Ethernet (10/100 Base-TX) to Fiber Port (100 Base-FX) switch that secures data transmission by using fiber optic transmission to provide immunity from EMI/RFI interference. The ANS-205FC operates at either half or full duplex mode. In full duplex mode, range is 2km with 62.5/ 125μm fiber cables; in half duplex mode, range is 412m with 62.5/ 125μm fiber cables. Unmanaged 4 Port Industrial 10/100BaseT Ethernet with Fiber 100BaseFX Switch with ST Connector. 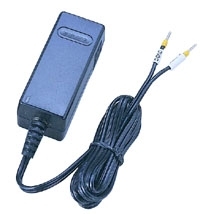 Secures data transmission by using fiber optic transmission to provide immunity from EMI/RFI interference. *. Use for Ethernet for transmitting a signal up to 2 Km(6,600 ft), and is the perfect solution for applications where transmission must be protected from electrical exposure, surges, lightning or chemical corrosion. The ANS-205FT operates at either half or full duplex mode. In full duplex mode The range is 2km with 62.5/ 125μm fiber cables; in half duplex mode, range is 412m with 62.5/ 125&mu;m fiber cables.